I have always been fascinated by mailboxes that have been custom built to look like something different. I pass a particularly interesting one each Tuesday on my way to teach piano. One day I remembered a suggestion made in one of Bryan Peterson’s videos on photography. He suggested photographing different letters of the alphabet as seen on street signs, buildings, manhole covers, etc. 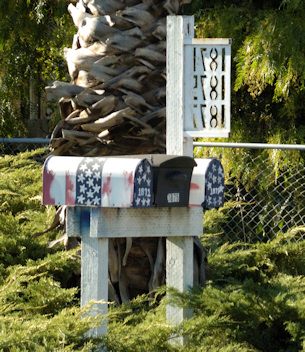 I realized that photographs of custom mailboxes would make an interesting collection, too. That’s what this web site is about. I do not make or sell mailboxes. These are photographs of mailboxes I have discovered in my travels. Want to contribute a photo? Contact me if you have a mailbox photo you would like to add to this collection. If I use it, you will be given credit for it. I generally don't accept photos of mailboxes that look like birdhouses because they are extremely common. A very unusual one might be acceptable, however.